On the day 50 years ago that the Rev. Martin Luther King Jr. was assassinated in Memphis, Julius Pearse was driving alone when he heard the news. Freeport’s first African-American police officer, then 34, pulled over and “I took my feelings out within the confines of a police car,” he recalled Tuesday. Fifty years later, Pearse and others who were alive then share the searing memory of when a 20th century icon was struck down April 4, 1968, by a bullet as he prepared to dine with friends. Some, like Pearse, mark that day and what it meant to themselves and the nation. On Wednesday, he will be in the ceremonial chambers of the Nassau County executive and legislative office building in Mineola for a 6 p.m. event held by the Dr. Martin Luther King Jr. Birthday Celebration Committee of Nassau County, a county-affiliated group Pearse founded. “The fact that he was assassinated 50 years ago, it is a solemn event for me,” said Pearse, 84, of Freeport. King had been in Memphis in support of a strike by African-American sanitation workers and had increasingly associated civil rights with class and economic inequalities. The event in Mineola will therefore honor a number of longtime county workers who were members of the civil service union, said event organizers. Rev. Calvin Butts, an activist Harlem clergyman and president of SUNY Old Westbury, said Long Island and America continue to evade moral challenges King raised a half-century ago. Too many people today mouth platitudes about King, Butts said Tuesday, while accommodating many of the injustices he fought, including rampant neighborhood segregation, substandard schools, sharp income disparities, and other maladies that persist on Long Island. Butts said African-Americans have seen progress — in college attendance, in leadership of major corporations and businesses, and in the presidency of Barack Obama. However, Butts said, “these are small achievements when compared to the masses of people — and now I’m speaking of all people, particularly poor white people, who do not have access to education because they can’t afford it, who do not have access to quality health care because they can’t afford it, who do not have access to quality housing because they can’t afford it. To commemorate the anniversary of King’s death, the Diocese of Rockville Centre has scheduled a special prayer service Wednesday at 7:30 p.m. in the Cathedral of Saint Agnes. It will feature prayer, witness talks, a homily preached by Bishop John Barres and the Sr. Thea Bowman Mass Gospel Choir. 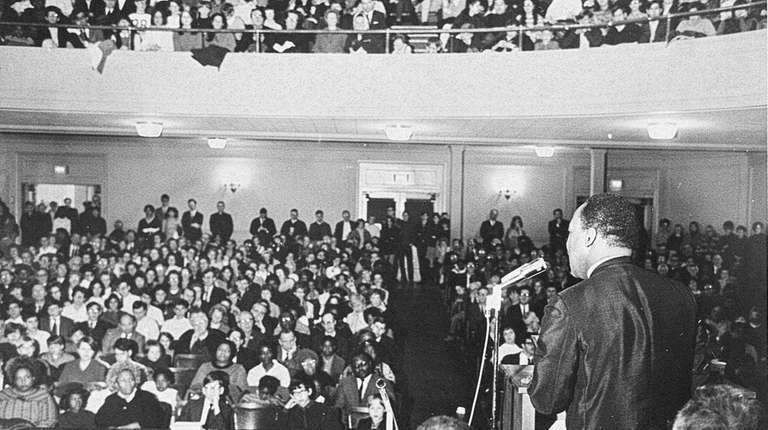 Now, as student and black activism rises to a level not seen since the 1960s, advocates for change say King’s example continues to inspire 50 years after his death. Tom Malanga, a white gay rights activist who helped organize the defunct Empire State Pride Agenda, said King’s nonviolent advocacy for human dignity has encouraged people from other marginalized groups to demand change. Hempstead civil rights attorney Fred Brewington, who last year won a decadelong lawsuit asserting that predominantly white Garden City used zoning laws to keep minority residents out, said King’s assassination made him determined to pursue racial justice. Brewington said he is now encouraged by the multiracial activism of students after the Feb. 14 shooting that killed 17 people at a school in Parkland, Florida. Editorial: 50 years later, King’s quest goes onOne wonders whether King thought the arc of the moral universe would take this long to bend only as far as it has toward justice. 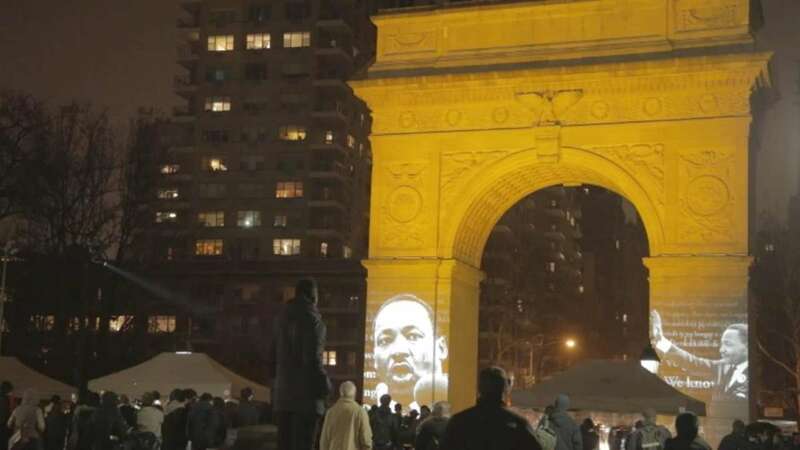 MLK called 'apostle of nonviolence' on anniversaryThe commemorations stretched from his hometown of Atlanta to Memphis, where he died, and points beyond.